There is no reason anyone should be denied a good meal at duck camp. Anything you can cook at home can also be prepared over a bed of coals or a portable gas cooker, especially if you know how to use a Dutch oven. Whether you'll be cooking indoors or out, when you bring the "fixin's" with you to camp, it makes sense to do much of the prep work before you leave your driveway. The majority of the vegetables, meats, marinades, and sauces can be prepared and packaged a day or two before you head out. Camp cooks take great pride in serving sensational meals to their hunting partners. Even when the birds aren't flying, great food and friends can make any trip to duck camp memorable. The following recipes aren't fancy, just delicious. You can make sausage out of just about any meat, including ducks and geese. My favorite camp breakfast is a homemade sausage patty topped with cheese and scrambled eggs and sandwiched into sturdy English muffins. This sandwich can be consumed at the table or packed away as an easy-to-eat duck blind snack. You can place foil-wrapped sausage sandwiches in a large coffee can with paper towels to fill up the air spaces. Secure the lid and it's ready to be loaded into your pack. If you're worried about transporting eggs, break them open at home and transfer the yolks and whites to a resealable plastic bag or a container with a tight-fitting lid. Add seasoning and cheese to the mix, and then simply pour the mixture into a lightly greased pan when it's time for breakfast. Consider freezing the sausage patties ahead of time. Once frozen, they will keep their shape. And if you vacuum-pack them they will require less ice in the cooler during the trip to duck camp. 1. Combine the goose, pork shoulder, and bacon. Grind the meat in batches using a grinder or food processor. Place the thoroughly ground meat in a large bowl. 2. Mix together the sage and next 4 ingredients in a medium-sized bowl. Add the apple juice and mix well. Add this mixture and the minced apple to the ground meat, using your hands to thoroughly mix all the ingredients for several minutes. 3. Form the meat mixture into balls about 2 inches in diameter. Pack each ball tightly with your hands, then place on a lightly greased sheet pan or on wax paper. Press down lightly on each ball to form a patty. 4. Sausage patties should be refrigerated immediately. If they are not going to be cooked within 3 or 4 days, freeze for later use. 1. Whisk together the eggs, salt, and pepper. Heat the butter in a large skillet over medium heat. Cook the eggs for 3 to 4 minutes, stirring often. When the eggs are still a little runny, add the green onions and cheese. Continue cooking for 2 to 3 additional minutes until the eggs are done. 2. For each sandwich, place one buttered English muffin half on a work surface or cutting board. Top with sausage, scrambled eggs, and another English muffin half. Add hot sauce to taste. What duck camp meal would be complete without something wrapped in bacon? With this recipe, the flavor is all built into the marinade. It's sweet and salty like teriyaki, with a spicy edge that can be adjusted to suit your own tolerance for heat. Since there isn't always time to adequately marinate the meat at camp, cut the duck breast fillets into strips and marinate them in advance. Cook the bacon, either at home or at camp, until it is half done. This will ensure that the bacon grills up crispy on the outside while the duck stays tender and juicy in the middle. Makes 6 appetizers (about 3 per person). 1. Combine the orange marmalade with the remaining marinade ingredients in a small saucepan over medium heat. Bring everything to a boil while stirring. Cool completely. 2. Place the duck pieces in a resealable plastic bag. Pour the marinade over the duck and toss to coat. Refrigerate for 12 to 24 hours. 3. Cut the bacon strips in half and arrange them on a clean work surface. Place a piece of marinated duck on the bottom of each strip, roll the bacon and duck up snugly, and secure each one with a toothpick or skewer. 4. Grill over medium-hot coals until the bacon is crispy. Duck camp is no place for cute little sliders or a tablespoon of meat on a cracker, especially after a long day in the marsh. The beauty of this dish is that the time-consuming cooking component is done well in advance. Whole ducks or breast fillets are seasoned, slow-cooked, cooled, and shredded much like pulled pork. As an alternative, you can use leftover duck from the previous night's dinner. Simply slice the leftovers thinly and marinate them in a tangy vinaigrette before cooking them in a hot cast-iron skillet with onions, garlic, and pepperoncini. Serves 6. 1. In a small bowl or bag, combine kosher salt, black pepper, garlic powder, and paprika. Liberally coat the duck with this mixture. Cover and refrigerate for at least 1 hour, but preferably for 6 or more hours. 2. Heat the oil in a heavy-duty pot, such as a Dutch oven, over medium-high heat. Add the duck and brown evenly on all sides. Add the onion and cook for an additional 5 minutes. Mix in Italian seasoning, crushed red pepper, and garlic. Cook for 2 minutes. Add wine and stir to deglaze the bits stuck to the bottom of the pot. Add vinegar and beef stock. Bring to a boil. Reduce the heat to low, cover, and simmer for several hours until the meat pulls apart easily. 3. Remove the duck from the pot and let cool completely. Once cooled, pull the meat off the bones or shred the breasts into bite-sized pieces. Strain the liquid from the pot and add it to the pulled meat. 4. To serve, reheat the meat and liquid in a skillet or Dutch oven. Add the pepperoncini and peppers and bring to serving temperature. Spoon the mixture onto rolls. White-fronted geese, often called specklebellies or simply specks, are generally acknowledged to be the best-tasting geese on the planet, but feel free to use this recipe with Canada geese as well. Kabobs are handy because they can provide meat, vegetables, and starches all in one. 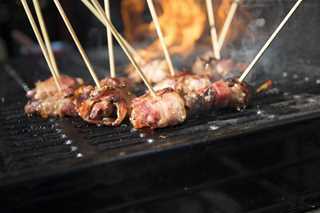 Wooden skewers are usually soaked in water for 30 minutes to keep them from burning over an open flame. I prefer the flexible wire skewers, which have a few distinct advantages over rigid wood or metal skewers. They are durable and can be used dozens of times; they are easier to use when pre-skewering for travel; and they will never burn. As with any camp cuisine, it's always easier to do the prep work at home. Cleaned and chopped vegetables will take up less room in the cooler than grocery bags full of whole produce. Specks don't need an overpowering marinade; a little quality olive oil and the right amount of seasoning will suffice. The key to cooking kabobs is to cut the veggies, meats, and starches into appropriate sizes. Rather than placing all three on the same skewer, try loading them on separate skewers to better control relative cooking times and temperatures. Your choice of vegetables is a matter of personal preference and local availability. During waterfowl season, I prefer fall and winter squashes. Serves 6. 1. In a large bowl, combine the olive oil, vinegar, lemon juice, brown sugar, garlic, kosher salt, black pepper, onion powder, and oregano. Whisk until well blended. Add the goose and vegetables. Toss to coat evenly. Cover and refrigerate for at least 3 hours and up to 12 hours. 2. Place the meat and vegetables on skewers and grill them over medium-hot coals or on a propane grill until cooked to desired doneness. 3. Serve the goose and vegetables on individual skewers, or remove the meat and vegetables from the skewers and serve them together on a platter. Whether your heat source is a bed of white-hot coals or a rustic camp stove, a Dutch oven can cook your duck to fall-off-the-bone deliciousness. It's an old-school slow-cooker for meat dishes that require low cooking temperatures and a little more time to make them tender. For those who prefer their waterfowl more like pot roast than a medium-rare steak, browned duck that is slowly simmered in a Dutch oven with vegetables and broth will get the job done. This recipe calls for cubed duck breast fillets. Whole or quartered ducks can also be browned and simmered in broth until the meat pulls away from the bone with ease. Once cooked and cooled, pull the meat from the bones and place it in the Dutch oven with the vegetables and stock. Makes 6-8 servings. 1. Season the duck liberally with salt and pepper. Heat a thin layer of oil in a Dutch oven over medium-high heat. Add the duck and brown it evenly on all sides. Mix in the onions, carrots, celery, and bell pepper. Cook, stirring often, until onions are translucent. 2. Add the garlic and broth. Cover and simmer for 2 hours or until the meat is tender. Add the sweet potato, russet potato, mushrooms, and rosemary. Simmer for 15 to 20 minutes or until the potatoes are just cooked. Season to taste with salt and pepper. 3. Serve with crusty bread.